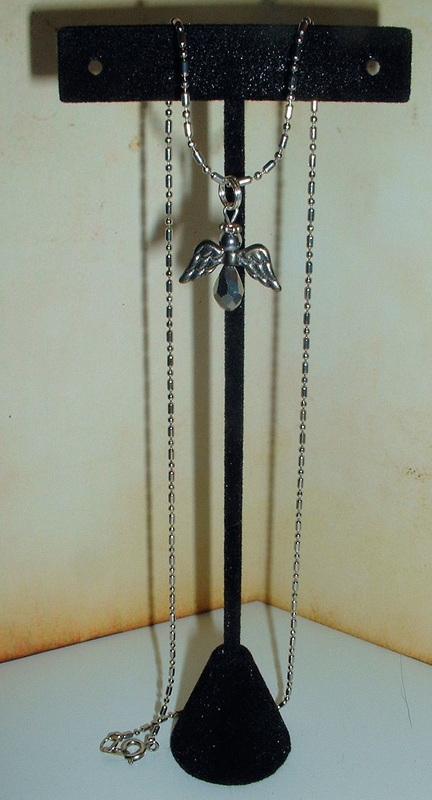 Sterling Silver halo, wings, wirework & bail. Laser engraved Brass Earth drop circling on an Antique Sterling Eternity ring around a Copper embossed Sun. 14k Gold Plate Chain & Stainless Steel components. Close Up of Orbital Necklace. 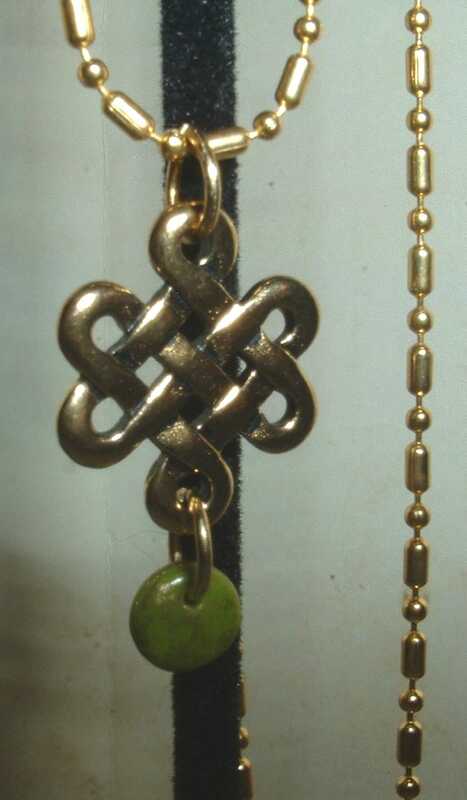 22k Gold filled elemental knot w/Peridot drop. 28" Gold Plated Stainless Steel chain. Close Up: Golden Elementals Pendant. Copper filled Claddagh, Wirework & Bail accented with hand-cut Connemara Marble bead. 18" Rose Gold Plated Stainless Steel Chain. 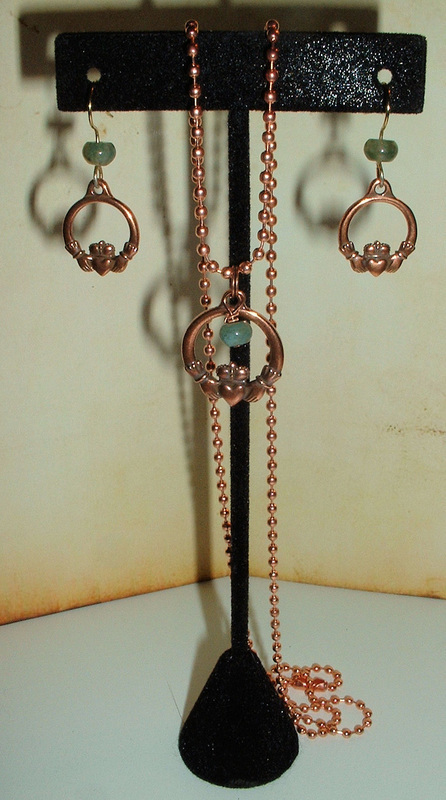 Close Up: Copper Claddagh Earrings & Necklace shown together. 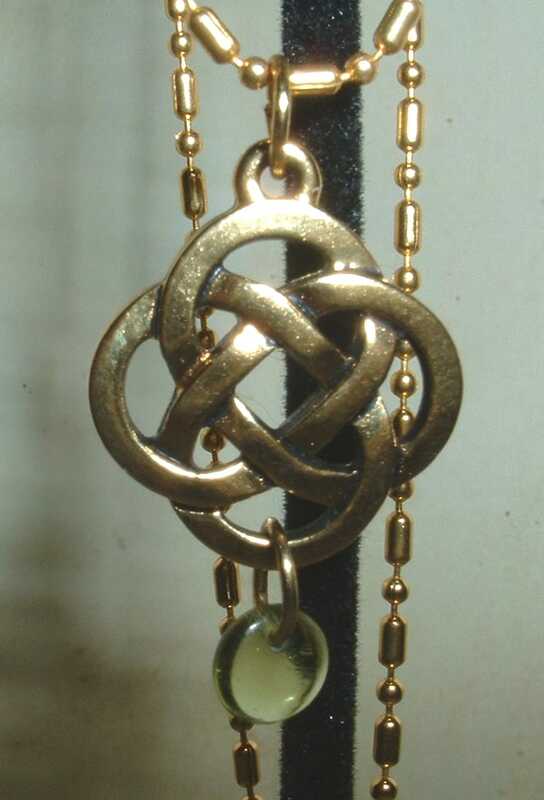 22k Gold filled eternity knot w/Olivine Peridot drop. Close Up: Golden Eternity Pendant. 14k Gold Filled Claddagh, Wirework & Bail accented with faceted Amethyst bead. 18" Gold Plated Stainless Steel chain. 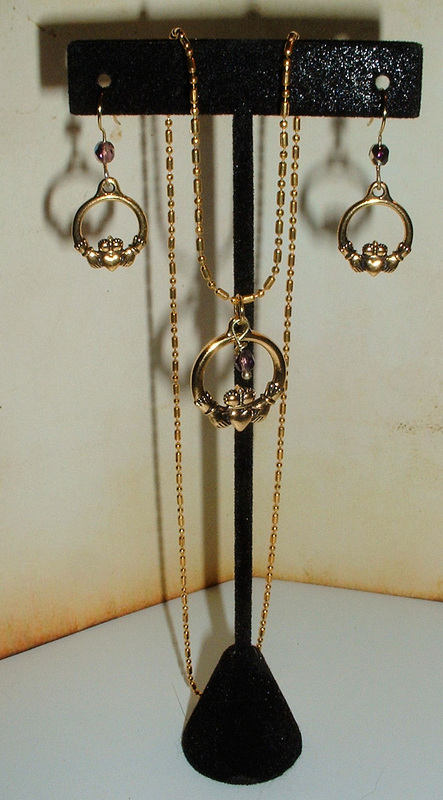 Close Up: Gold Claddagh Earrings & Necklace shown together. Adjustable 15-20" long Silver plate and Tourmaline beaded necklace. Fixed pendant dimensions 1-1/2"wide x 1-3/4"tall add to the length. Large Dichroic glass finished with a hand created wire swirl. 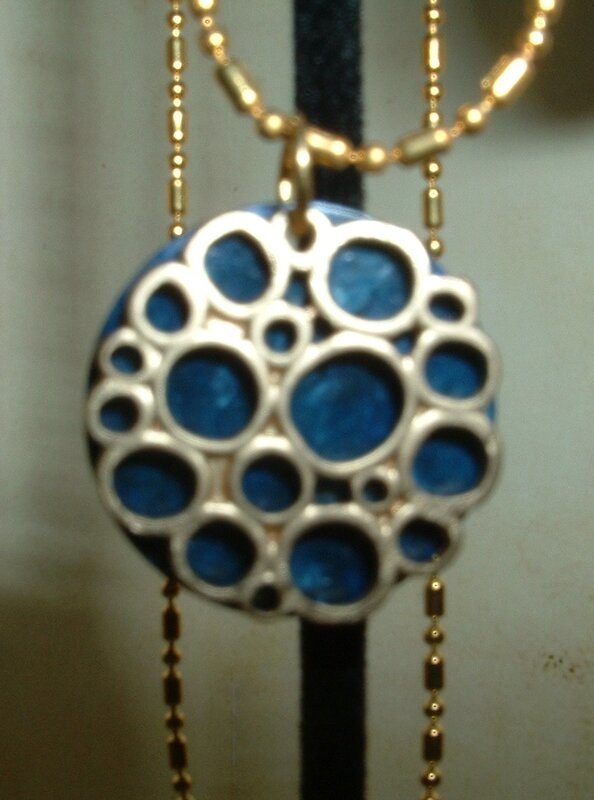 Laser cut 14k Gold bubbles design drops layered with enameled Brass discs. 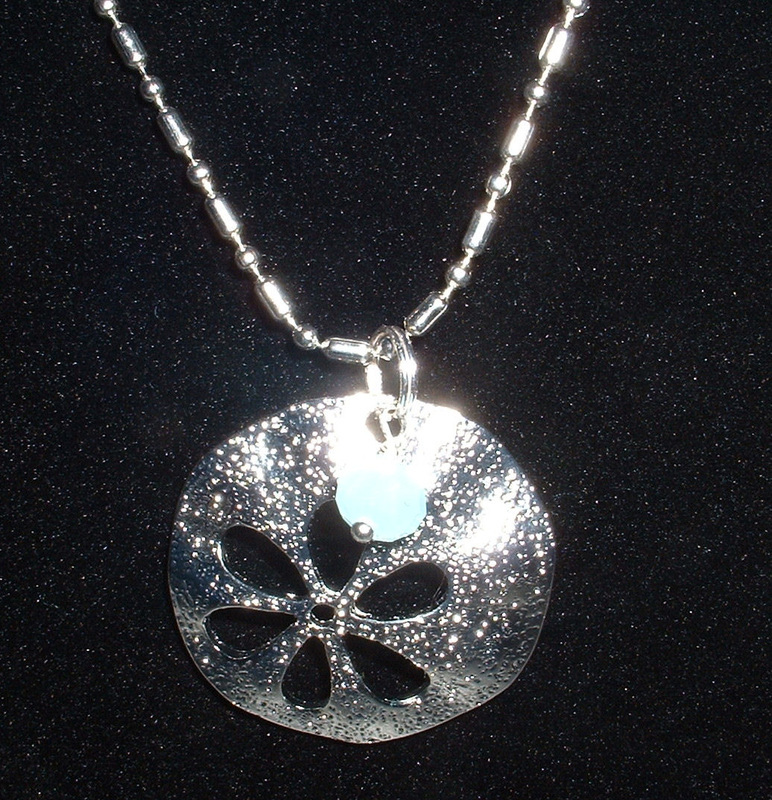 Stainless Steel laser cut, hammered and embossed sea biscuit design layered w/faceted Florida sea glass and Sterling components. 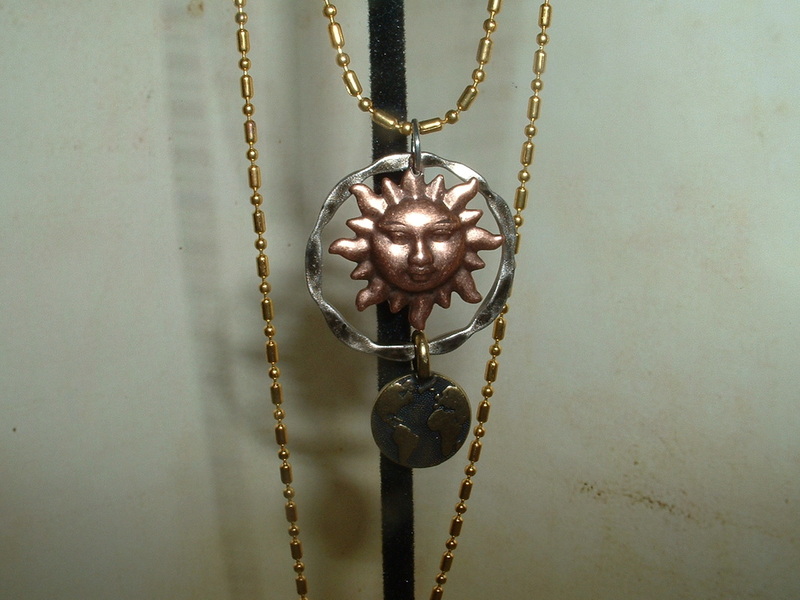 Necklace: Copper filled ball chain with open link extender & lobster claw clasp. 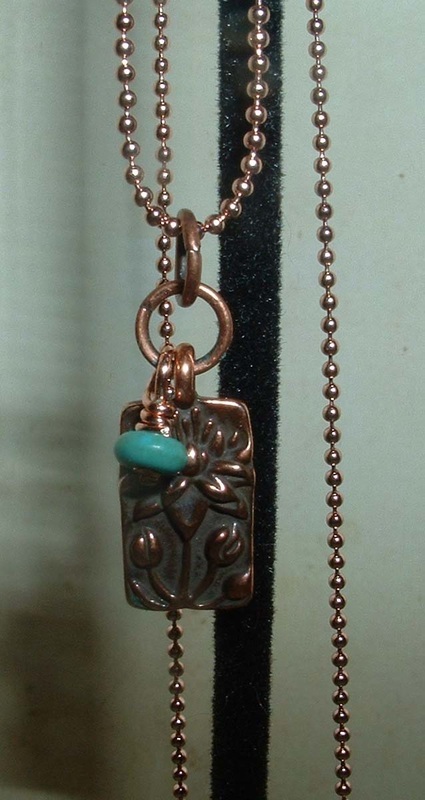 Pendant: Sculpted Copper filled double-sided Lotus charm w/Turquoise drop. Sterling Silver links & wirework. Hand painted iridescent brown on Bronze rectangle drop layered with genuine Turquoise carved peace sign charm. 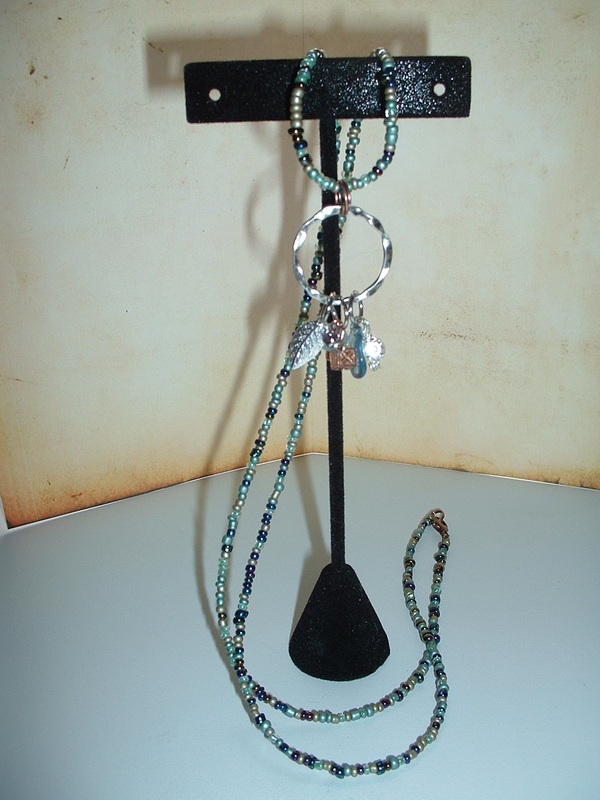 Sterling wirework & bail. Hand painted iridescent black on Bronze rectangle drop layered with genuine Turquoise carved peace sign charm. Sterling wirework & bail. 29" inch glazed sea glass beaded necklace with copper components and lobster claw clasp. 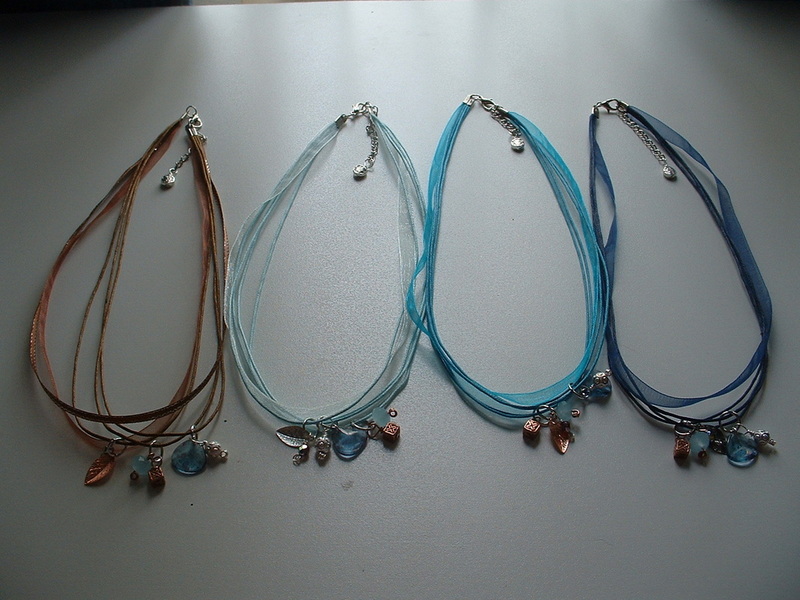 faceted Sea Glass, Aquamarine & Amethyst beadwork. 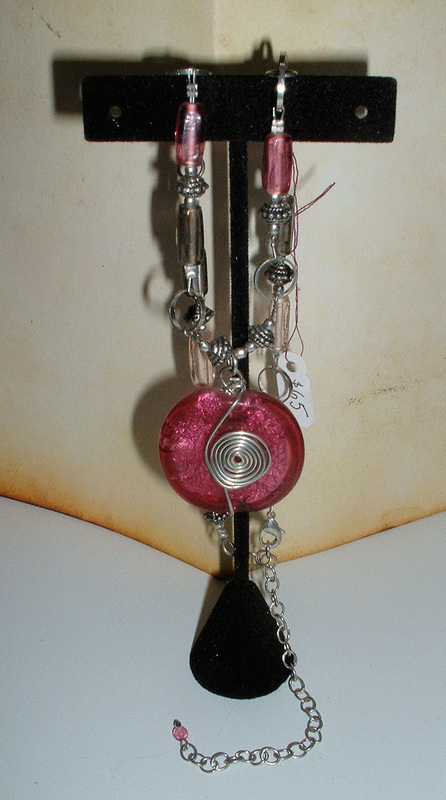 Adjustable 28-32" hand strung glass beaded necklace w/Antique Silver lobster claw clasp. Fixed pendant dimensions 1-1/2"wide x 2-1/2"tall adds to the length. 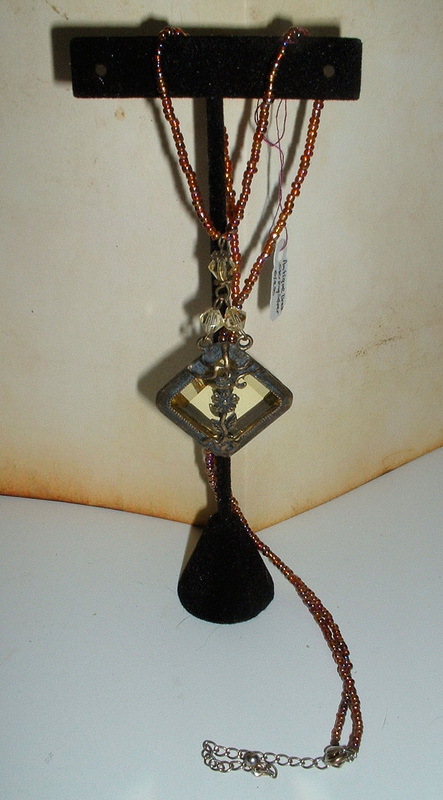 Faceted Citrine beads, antique Brass components encase a faceted mirror back prism crystal. 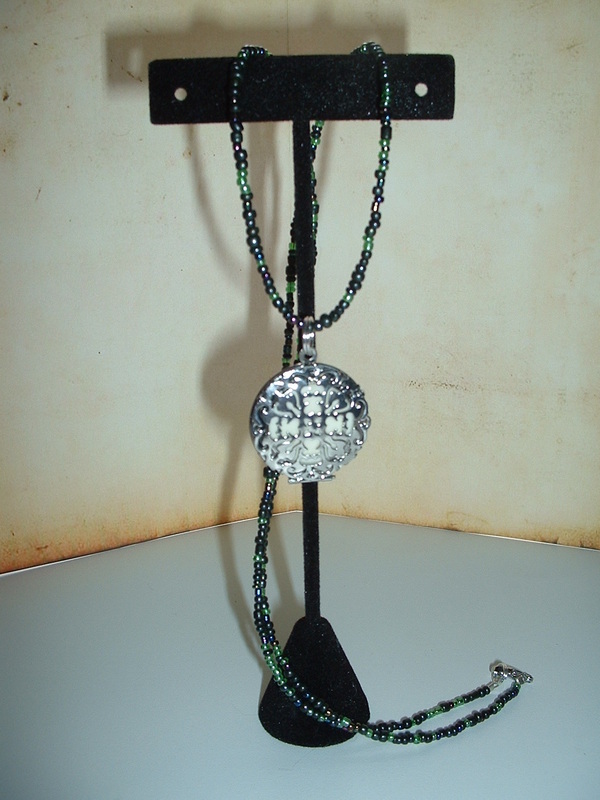 24" inch glazed sea glass beaded necklace with nickel free silver plate components and lobster claw clasp. 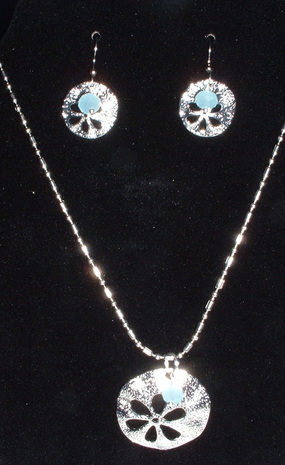 Sterling plate filigree pendant houses "magic" that glows in the dark! 18" inch multi layer ribbon necklace with 2" extender chain & lobster claw clasp. Nickel Free Silver Plate Components. Special order available for all colors and black! Click on Photograph for a larger image. 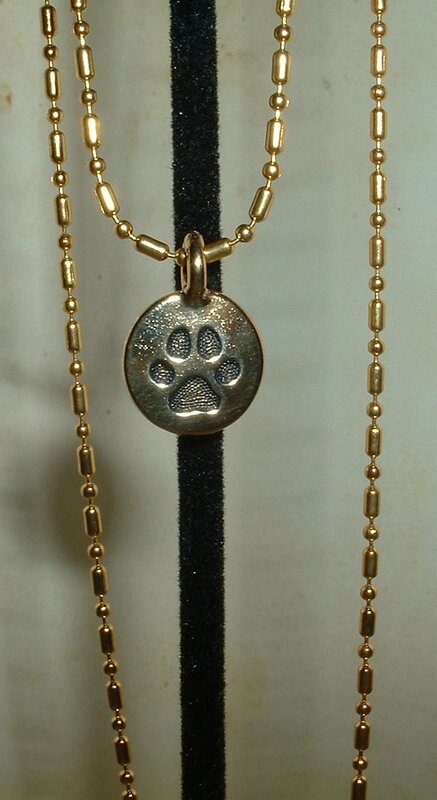 Laser engraved 14k Gold filled paw pendant. 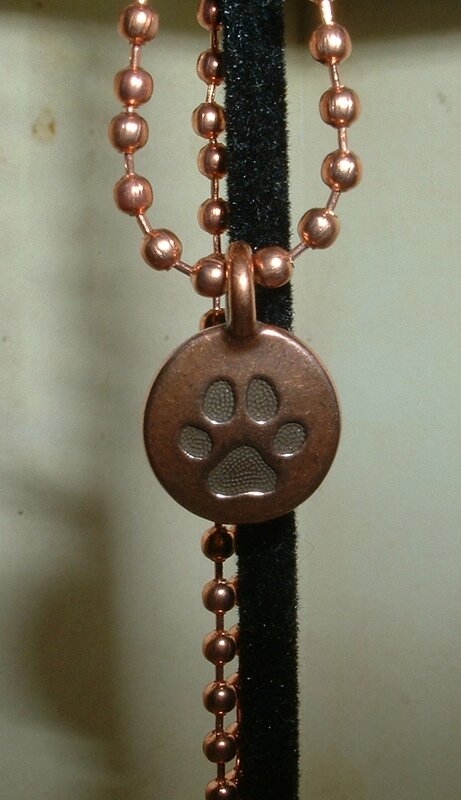 Laser engraved Copper filled paw pendant. 22" Rose Gold Plated Stainless Steel chain. 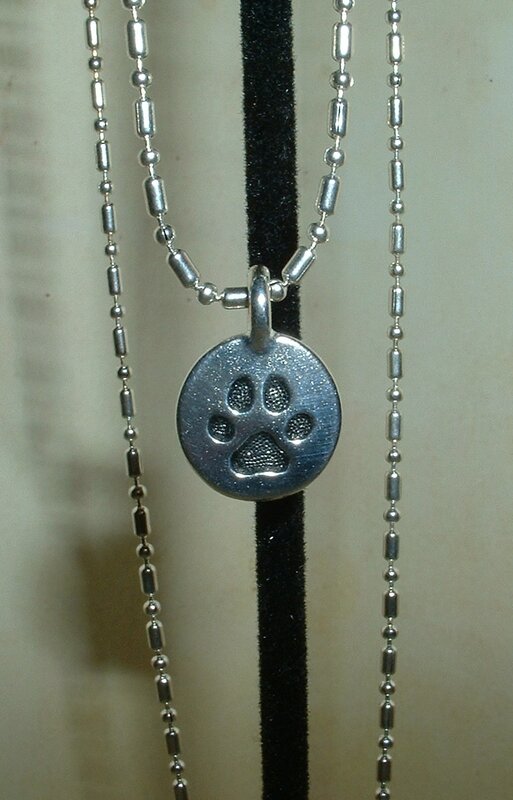 Laser engraved Sterling filled paw pendant. 28" Sterling Plated Stainless Steel chain. 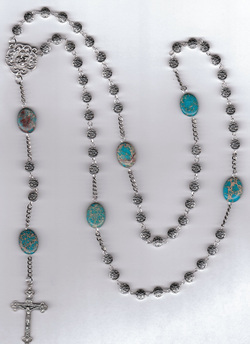 Turquoise & Sterling Necklace measures 23" plus a 3-1/2" extender w/turquoise & coral drop. 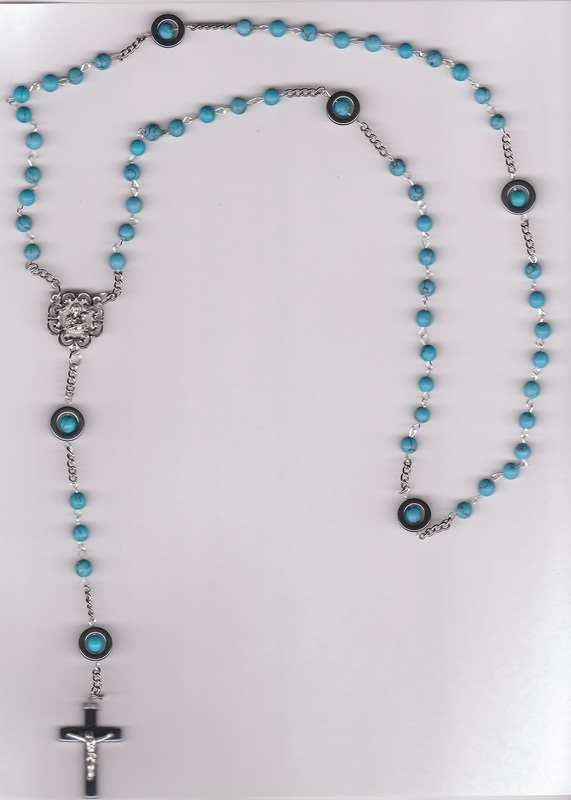 Removable Pendant's Overall Size is 1-3/4" x 3-3/4"
All Profits from Rosary Sales are Anonymously Donated to Humanitarian Non-Profit Organizations. Click on Photograph for larger image. Hand created sterling silver links string five decades of the rosary together with stainless steel chain for extra durability. The centerpiece of the Madonna w/Child as well as the Budded Crucifix are crafted in Italy. Hand created sterling silver links string five decades of the rosary together with stainless steel chain for extra durability. The centerpiece of the Blessed Virgin Mary as well as the Budded Crucifix are crafted in Italy. 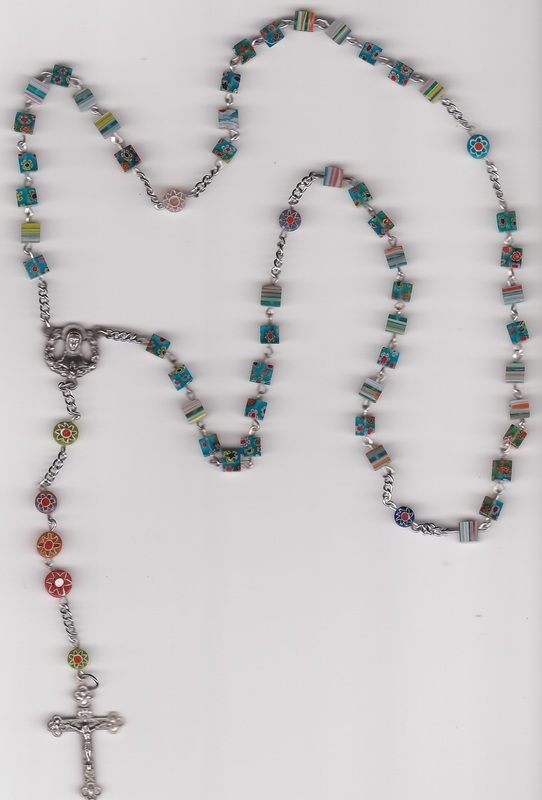 Fifty square Millefiori beads and Nine round Millefiori beads feature striped sides and floral patterns on each bead. Hand created sterling silver links string five decades of the rosary together with stainless steel chain for extra durability. The centerpiece of the Madonna w/Child as well as the Hematite Crucifix are crafted in Italy. 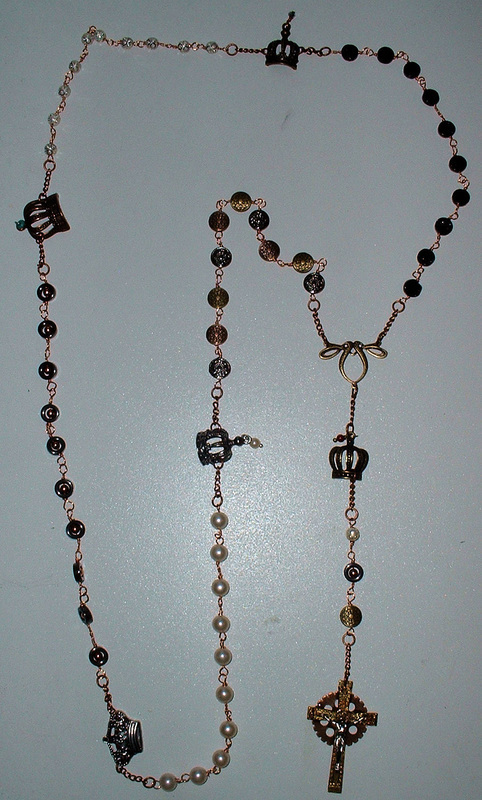 Hand created copper wrap wire links string five decades of the rosary together with Copper link chain for extra durability. The centerpiece is ribbon bronze, the crucifix is hand rubbed bronze in several finishes with gear work accent. 5mm, 6mm, 8mm & 10mm beads made of Copper, Antique Pearls, Medallions, Hematite, Red Coral, Turquoise, Sterling, Black Sandstone, Marcasite. "Our Father Beads" are hand rubbed bronze crowns with bead work that features brass, silver filled & gold filled wire work. Each decade is unique design.